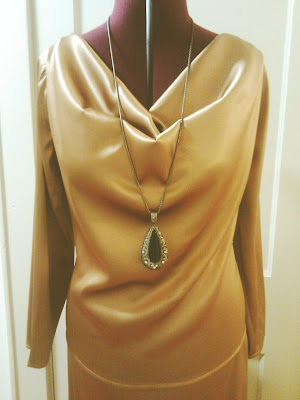 Last week, I was asked to make a garment for a dear friend for an Eastern Star Gala event. Initially, I was ambivalent about it in that I feel people don't fully understand the time and effort it takes to make a garment. 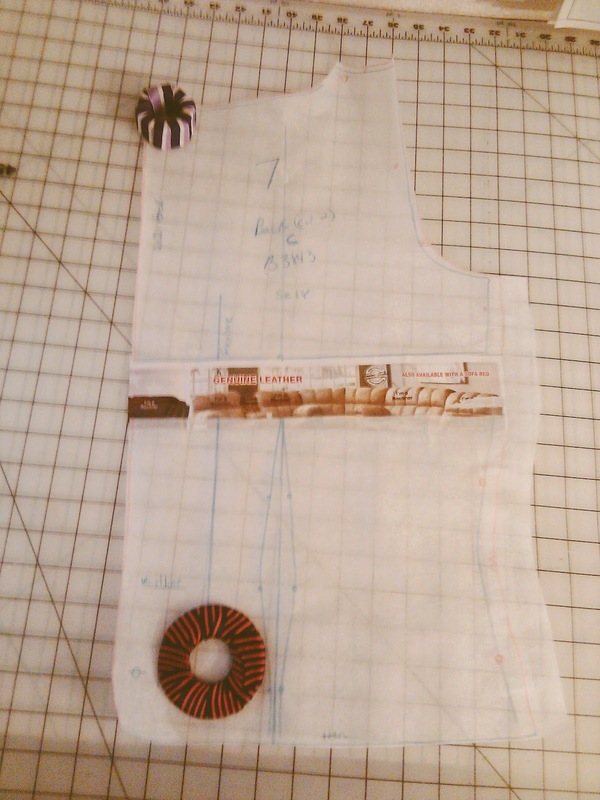 You know the particulars... design style, tracing, cutting, sewing, adjusting to make it fit, handstitching & pressing. However, her easy going personality and her you can do it mantra persuaded me to take on the challenge. Linda wanted a simple garment for the event and left it up to me to pick out a design. She'd also stated that she wouldn't mind one of my favorite wrap dresses, just make a formal skirt. 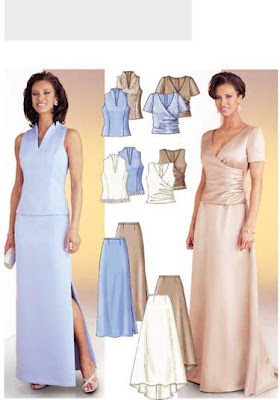 Initially, I had plan to go with that idea, but remembered I had a few evening gown patterns. 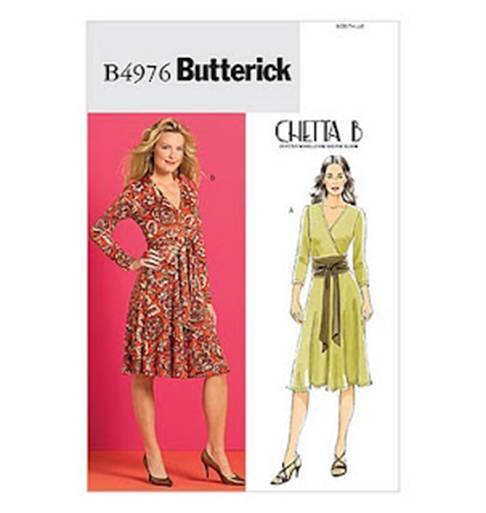 and chose Butterick 3843. She opted for the beige cross-over top with long sleeves and the lt. blue formal skirt without the split. I gave her a list of fabrics spots to go to (Virgo Fabrics, 123 Fabrics & Silk Roads) and she was able to purchase the fabric from Virgo Fabric, which is an antique gold stretch poly charmeuse. 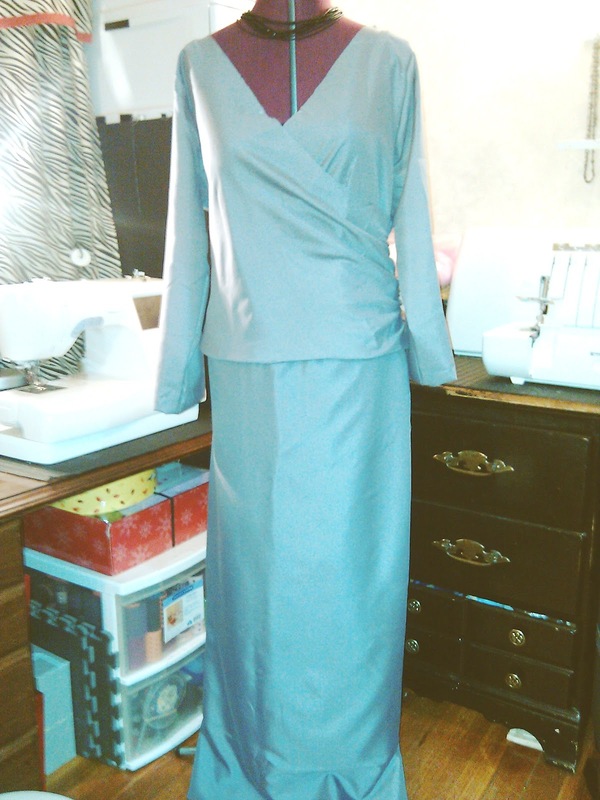 We met up and I took her measurements and thereafter prepared the pattern for alterations. Alterations included widening the sleeves using this reference (page 4), used Vogue 8151 to trace length and lengthened the top 2"
After the alterations were made I proceeded with the muslin. Everything was looking good until I noticed that the top raised up considerably when she raised her arms. I contacted Cennetta and she was kind enough to help me identify the problem and I also referred to this for making the adjustment. Made the adjustments and we met again, and thankfully the skirt needed only minor tweaking which was removing too much ease. I tend to have issues with zipper insertion, but this zipper went in without a hitch. .... she was very happy with the outfit and had a great time at the gala. This was truly a learning challenge, the usefulness of a muslin, mindful to use muslin fabric similar to fashion fabric, altering pattern pieces, improving my zipper insertion and having a Plan B when all hell breaks loose. Sleeves are a never ending mystery! Just when you think you've figured them out something wonky happens. But the dress looks great and I bet your friend felt like a million bucks in a custom dress that was made for her! Wooo, girl, you are BRAVE! The dress came out gorgeous -- what a lucky friend you have. The final dress is absolutely beautiful. Glad that this worked out for you and that she enjoyed wearing the outfit. I am always in awe of those who sew for others, cause I'm just not going there! How gorgeous. You've made a lovely gala outfit. I only sew for easy going people. It makes the sewing construction process less emotional. You did a great job overcoming your friends fit issues. Love your work. Beautiful work, I know she was pleased. Bless you for sewing for others, not something I'm going to do lol. You are a thoughtful seamstress ! I love both outfits. Hey There! How are you? Another amazing outfit! I'm sure your friend was totally thrilled with it. Worth all your effort. Looks fabulous! Your finished dress is goregeous! I'm sure your friend was well pleased. The learning challenge has elevated your sewing skills up one notch. I know what you mean, folks really don't understand whats involved in sewing a garment. The sewing Gods bless you a wonderful customer, job well done. Despite the challenge, you did a beautiful job!!!!! Thank you for the beautiful compliments. 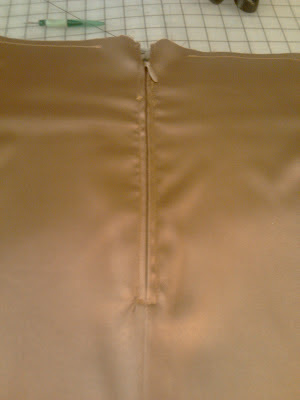 I will say I was a nervous mess after the cross over bodice armhole issue. However, my dear friend was very calm, cool & collected and had so much confidence in my sewing... making it all an awesome learning challenge. What a nice thing to do for your friend. I learned the hard way that muslins are the key to eliminating frustrations and disappointments. The outfit is so pretty! You did a beautiful job! I applaud those that sew for others lol. I can't do it. You are too kind! The dress looks great. My nurse asked me kind of jokingly if I would make her a mother of the groom dress for her son's wedding. There's no way in HELL I would sew a dress for somebody - you're a really awesome friend.